In times of conflict, not everything is about what goes on in the front lines. Sometimes, there are just as many interesting stories about what happened in the rear or on the home front, and that is the case here. As with many historical events, multiple factors came together in combination, which resulted in a catastrophic and horrific manmade disaster. Fortunately, even in such cases, humanity came together after the fact to at least attempt to ameliorate the death and destruction inherent in any such occurrence, making for a kind of bad news/good news story. Humans caused the “problem” yet also demonstrated that, in the worst of times, they could come together selflessly and altruistically for each other. In the greater context of World War I, one must consider the necessity of keeping armies supplied whether on the offensive or defensive. With the Western Front almost literally eating up manpower at a prodigious rate, it was obvious that maintaining at least the status quo would also require ammunition. Inasmuch as artillery and machine guns had become the darlings of the battlefield, equally prodigious consumption of ammunition was evident. In order to maintain the supply line for such, merchant ships were necessary to deliver the quantities of ammunition to keep the armies supplied. In December 1917, one ship, the French freighter Mont Blanc, was loaded in Brooklyn with a multiple and volatile combination of munitions (TNT and other unstable compounds) to equal some six million pounds. Compounding this cargo load was the fact that the on-deck loading of fuel drums or barrels was rather haphazard. Carrying, much less lighting, matches or smoking was prohibited and wearing shoe covers to prevent sparks as one walked across the deck were required as the ship made its way up the East Coast through rough North Atlantic waters infested with German U-Boats. Making port at Halifax, at the time, the busiest one in the world, one would have thought that the ship had reached safety. Unfortunately, that’s where the trouble began as a series of events conspired to cause the largest manmade explosion in history prior to the detonation of the first nuclear device less than 30 years later. If one has any understanding of the nature of explosions, then it is certainly understandable that in a harbor surrounded by commercial, retail, and residential communities, nearly two and one-half square miles of the city were absolutely destroyed with the loss of 2,000 souls and injuries to some 9,000 more. And this occurred in less than the blink of an eye—one fifteenth of a second. What followed, however, was a shining example of humanity coming together, not just in Halifax but across Canada, the United States (in particular Boston), the British Empire, and elsewhere, to provide succor to the survivors with medical aid, food, temporary shelter, fuel, clothing, and other necessities of life in what was essentially winter in Canada. 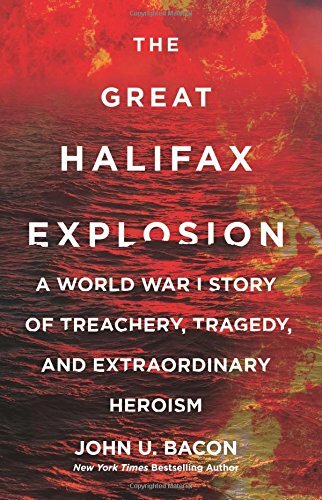 Not surprisingly, Haligonians, residents of Halifax, have never forgotten the incident nor the manner in which others responded to their hour of need and continue to remember that day in December 1917 when it seemed as if their world had ended. Reading this, one will understand how all of this came to be. Author John U. Bacon sets the stage with the preliminary story of the Mont Blanc and proceeds to line up the factors that came together to create this disaster, and then tells the tale of why it happened: from outright human error and confusion to violations of the rules of nautical navigation. Also included is a recounting of the legal proceedings that dragged on through different courts over the course of several years and the repercussions, legal, personal, and otherwise—or lack thereof—for all of those involved. Although this event is largely unfamiliar to most, Bacon’s bibliography shows that there are considerable sources extant to tell this tale of destruction on the home front as well as how it came to transform personal perspectives, influence advances in pediatrics and ophthalmology, and show science the overwhelming potential of weapons of mass destruction. If nothing else, this is a shining example of the inherent imperfections of human beings and how things can go so wrong in short order to cause a catastrophe on an unimaginable scale.